A great day out in the sun with your RC car or quad when suddenly your battery runs out! You groan as you know it will take up to 2 hours to charge it and what will you get? Another 15 minutes of play time? This is why you should throw that stock charger away and invest in a faster and better battery charger! LiPo batteries are the most common batteries used in the RC world, thus their chargers are easily available on the market! 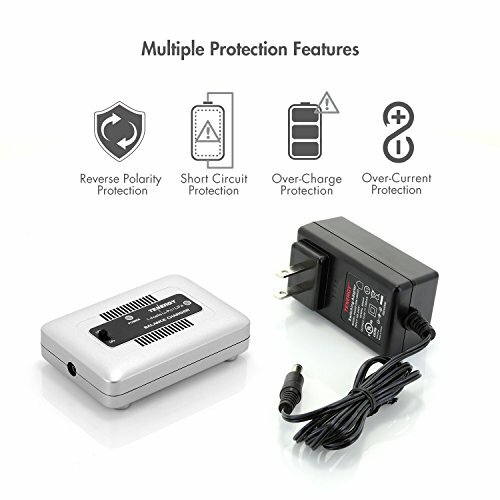 However, before you go on to selecting one, read our reviews first to make an informed decision and buy the best lipo battery charger you can afford! The Genuine SKYRC iMAX has the ability to charge not only LiPO batteries but a variety of other types of rc batteries. Each cell will be balanced while charging and you will be happy with how safe a quickly your LiPO batteries are charged. Balance Chargers: The Balance Chargers are designed exclusively for Lithium Batteries to monitor each cell individually and balance them equally. They include safety features such as an auto shut off in case of a full charge. This saves your batteries from overcharging and getting damaged. These devices are very specific when it comes to the voltage and the battery type they are charging. Smart Chargers: Smart Chargers are compatible with a large variety of batteries including NiMh, NiCd and Lithium batteries. They can charge at different voltages as well. They are best for professional users who need a universal charger for all their RC devices. It features different charging modes as well. The most popular example of a smart charger is the Genuine SKYRC iMAX B6AC charger included in our review. When it comes to picking out the best LiPo battery chargers for RC vehicles, even professionals can get confused over which one to use. Chargers may seem too technical for some folks, however, there are only a few factors that you need to look into before making your decision. Below, we have listed the top attributes you need to consider before buying a LiPo charger. LiPo chargers are available at a variety of prices. First and foremost, you need to set a budget for the product you are going to buy. For beginners or hobbyists, we recommend going for cheaper non-programmable versions that do not have a lot of features. However, if you want to have faster charging, we recommend investing a little bit more in a programmable one or one that has more features. Next, you need to consider is the type of batteries you can use the charger on. Of course, if you have a LiPo battery, you might want to go for a cheaper battery charger that only supports a Lithium battery. If you wish to take your hobby up a notch in the future, then investing in a wider compatibility charger can suit you better as you might want to change your batteries in the near future. Thus, we recommend buying multi-chemistry chargers for such purposes. Non-programmable chargers are easy to use and you do not need any prior knowledge to operate them. Simply Plug them in and let the battery charge. Keep in mind though, they can be extremely slow and do not feature a lot of settings options. For beginners, who do not wish to entangle themselves in such hassles, these would be better. For more professional purposes, a programmable charger can allow them to control the charging current, the type of battery, the charging period, etcetera. This results in faster charging! One of the major factors to consider is the speed of the charger. Cheaper LiPo chargers do not charge fast at all, whereas the more expensive ones including the smart or programmable ones can increase your charging speed drastically. If you wish to use your RC vehicle occasionally in your backyard, then perhaps a slower cheaper charger will suffice. Professional or programmable chargers can be harder to use as they require you to enter all kinds of inputs. If you do choose to go for a programmable charger, ensure it is as simple as possible. Having extra useless features can be a pain. Most batteries carry a dual or parallel charging capability whereby you can charge two or more batteries at the same time. Dual chargers can be great when you want to ensure longer play times. The Maximum power in watts that your charger can charge will essentially determine the capabilities of your charger. Batteries with lower capacities or C rating might need higher power chargers. Cell count means what maximum number of cells your battery must have to use the charger. Most chargers can charge up to 4S while others can charge up to 6S. The higher the cell count the better. 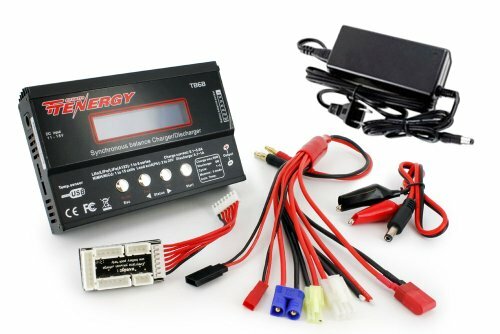 These Lipo battery chargers will have you back up and running your favorite rc cars and trucks in no time. They have outstanding features that set them apart from the competition. 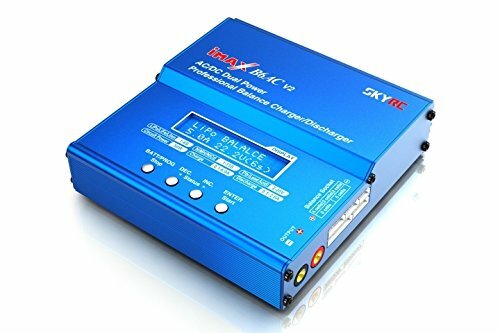 The iMAX RC Balancing Charger by SKYRC is the best LiPo battery charger to charge your RC vehicles with. Whether you are a professional or an amateur, this dual power charger can provide you with fast and quick charging. It works on a current of 6 amperes and provides a power of 50 Watts. The Charger can charge various types of batteries including Li-Ion, LiPo, NiMH, and more. You can set it to terminal voltage and connect it to a computer for control as well. With the SkyRC you can be assured of safe charging due to the automatic capacity limit, charging current limit, Processing Time Limit and temperature threshold. The LiPo charger comes with its own app as well to ensure proper control of the charger. Not only does this device efficiently charge, it discharges batteries as well and balances each cell of the battery while doing so. Supports Various types of batteries including Lead Acid. Available with its own app. Can be fully controlled through Personal Computer. It can support 6 celled batteries. It can be a little complicated to operate and might result in errors that require technical support. The Tenergy Lithium Balance Charger is perfect for beginners because of its simple operation and efficient use. The Tenergy is an acclaimed brand in the world of electronics. So, it goes without saying that their Lithium Balance Charger would be nothing less than top quality. The charger features a Built-in Balancer whereby batteries are balanced automatically during the charging process. This ensures full charge each time. Also featured is a balanced charging method where it charges each cell individually. The exquisite device is perfect for Li-ion, LiPo, and Li-Fe batteries. The charge rate is 1 amperes and its fits 1S- 4S batteries. The device operates under a voltage of 3.7 V – 14.8 V.
Furthermore, it features an XH type connector. The charger features maximum safety features that ensure maximum protection including Short Circuit Protection, Reverse Polarity Protection, Input Voltage Protection. The Tenergy can serve your RC charging needs while providing you with a quick and fast charring solution! Charges only Li-ion, Li-Fe and Li-Po batteries. The charger can not discharge your battery. It cannot be used for other battery types. 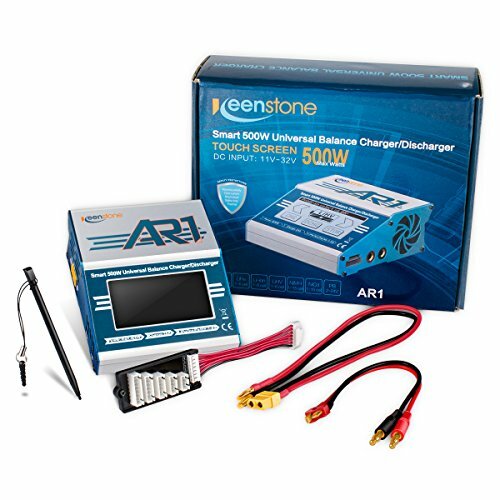 The Keenstone is yet another RC professional charger that might be a little too complicated for beginners to use. However, the Battery Charger is equipped with a smart touch interface for simpler operation. It features a mini USB port that allows for any upgrades. The charger supports 1S- 6S battery types. It can further support a wide variety of batteries including LiPo, Li-Ion, LiFe, LiHv, NiCd, NiMH as well as Lead batteries. The device delivers a charge current of 0.1 – 10 A and a power of 500 Watts. The charger is quite efficient in discharging as well, where it delivers a discharge current of 0.1-5 A and a power of 10 W.
The Keenstone includes a balancer as well to ensure full recharge. Also included is a Lithium Battery Meter that checks the voltage of Lithium Batteries. The best of all: The product can store 10 different types of battery settings ensuring you never have to enter the data again! The package includes a Smartpen and an AC Adapter as well. Lastly, the product is extremely safe to use. Supports 1S – 6S battery types. Stores 10 types of battery settings. Supports a wide range of battery types. Balances each cell of the battery while charging. Includes a Lithium Battery Meter. The charger can be a bit complicated to use. It does not have its own app, so accessing it might be harder. When it comes to anything related to RC vehicles, Traxxas has definitely outdone themselves by selling all products you could possibly need during your crazy RC Adventures. The Traxxas Charger is made from the highest quality materials to ensure a lasting performance. It is exclusively designed to charge faster than the stock charger in under 60 minutes. The EZ-Peak charger charges at a current of 6 Amperes which ensures an extremely fast performance. The device can charge 2S – 6 S batteries. This charger can charge both LiPo and NiMH batteries. It uses an XH connector and works only on those batteries that feature a Traxxas connector. It can charge two batteries at the same time, however, the two batteries should be of the same composition. Also featured is a balanced Mode that ensures safe charging of LiPo batteries. In addition, the charger charges each cell individually ensuring all cells are charged up at the end of the cycle. It features a lot of safety functions where the charger automatically shuts down once the battery is fully charged. 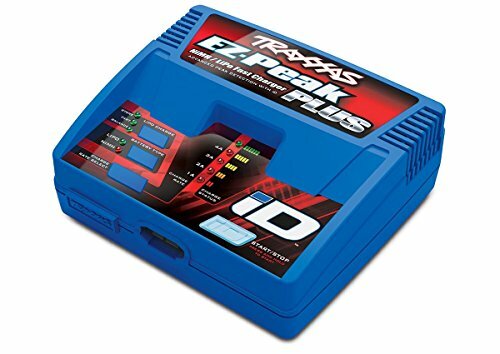 The Traxxas EZ-Peak is easy to use and can thus be used by beginners as well as Professionals. Works well with 2S – 6S batteries. Charges only LiPo and NiMH batteries. Includes a Balance Mode as well. A low discharge rate of up to 2 Amperes only. It has a loud fan. Another high-quality product from Tenergy, the Charger/Discharger is perfect for professionals who wish to have one charger that fits all their RC battery needs. The Tenergy can charge a wide variety of batteries including NiMH, NiCd, LiPo, Li-Ion, Li-Fe and SLA batteries making one if the best multi battery chargers available. The Charger is equipped with a balanced mode to ensure all cells get charged evenly. Batteries anywhere from 1S to 6S cells can be charged easily. A bonus feature of this charger is that is compatible with a large number of leads including, Tamiya, JST, Hitec, EC3, and Deans Connector. Furthermore, the large voltage capabilities of the charger allow for a wider option for the battery. The Charge Current is about 0.1 – 5 A while the power is 50 Watts. The Discharge current is 0.1 – 1 A while the power delivered is 5 Watts. Also featured is data storage and load storage so you can access different types of battery settings. Along with faster charging and discharging, the charger ensures complete safety! Charges a wide variety of batteries. Capable of delivering a wider variety of voltages. Compatible with all kinds of connectors. Balancer and Data Storage Features included. Works better for 1S – 6S Batteries. The Discharge current is quite low up to 1 Amperes. All in all, LiPo battery chargers can be of varying types and can support multiple features. Ultimately though, if we had to crown one of them as the best lipo battery charger, then that would no doubt go to the Genuine SKYRC iMAX Professional Balancing Battery Charger. It is essentially a smart programmable charger that can be used with a wide variety of battery types and 1S – 6S batteries and that is why we choose it as the best lipo battery charger. Along with that, it features various charging voltages as well as some other amazing features such as a Lithium Battery Meter and an Internal resistance meter. It discharges the battery as well and balances each cell! The SKYRC iMAX is the solution to all your charging problems!